Upton Town Library : Pajama Drive at Upton Town Library! Now until March 15! Pajama Drive at Upton Town Library! Now until March 15! 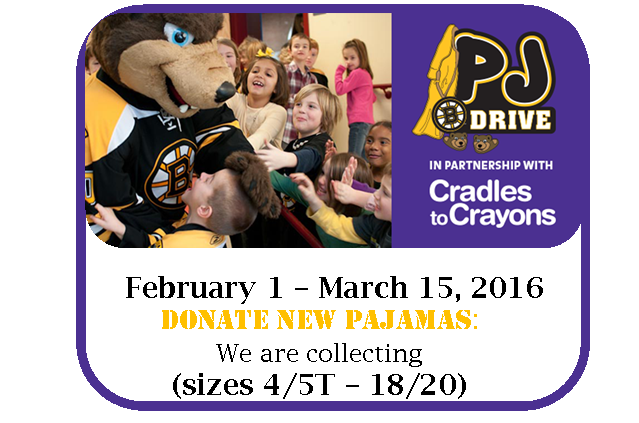 Upton Town Library is partnering with the Boston Bruins and Cradles to Crayons to provide new pajamas for local children in need across the Commonwealth. The PJ drive runs February 1 through March 15, 2016. You can make a difference by bringing in new pajama donations (sizes 4/5T-18/20) to the Children’s Room at Upton Town Library. Cradles to Crayons provides children from birth through age 12, living in homeless or low-income situations, with the essential items they need to thrive—at home, at school and at play. Donations are processed and packaged by volunteers, and distributed to disadvantaged children across the state through a collaborative network of social service agencies and school partners. For questions or more details, please call the library 508-529-6272 or email nicole.uptonlibrary@gmail.com.